How can financial services serve? A 2010 book, Portfolios of the Poor, made a big impression on me because the researchers had taken great care to ask poor people (in Bangladesh, India and South Africa) in great detail how they managed their money and what their financial needs were. The answer was different from the enthusiasm at the time for micro-credit schemes. It turned out people with not much income need secure vehicles for saving and transactions; borrowing was a low priority, and few people will become entrepreneurs, micro or otherwise. 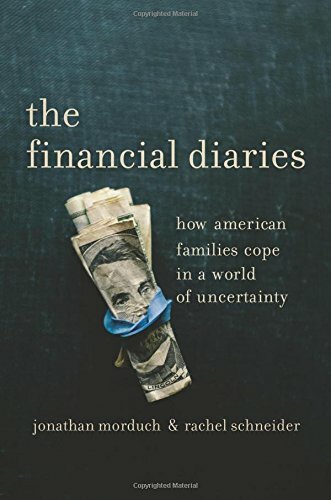 Jonathan Morduch, one of that team (with Daryl Collins), has now co-authored (with Rachel Schneider) a book taking a similar, detailed look at the finances of American families. They investigated (using the same method of detailed diary-keeping and interviews over an extended period) families in several parts of the country who ranged from single mothers living in poverty to nuclear families a notch or two above median income for their area. One could call them the ‘left behinds’. The results, written up in The Financial Diaries: how American families cope in a world of uncertainty, is just as illuminating. The headline is that the volatility of income is a bigger problem for most of those interviewed than their level of income. This volatility is closely linked to the way the labour market in the US has moved toward less stable conditions, with employers shifting risks steadily onto employees. “Over half of all income volatility was due to changes in income from the same job.” Even the higher income households in the sample experienced significant earnings volatility. When income is uncertain, or even when it isn’t but is only slightly higher than regular outgoings, then emergency expenses – healthcare above all (this is the US! ), but also car repairs when the car is essential for work – mean it is difficult for people to save steadily. The juggling involved in managing their finances, and the fragility of financial security, also occupies so much mental bandwidth (as per Scarcity) that people find it hard to get off the financial treadmill by any long-term planning. Clipping coupons seems a high priority compared with saving up to pay for college, albeit there are some exceptional focused individuals. Perhaps it isn’t surprising to learn that financial services do not serve most of these households (up to and beyind the median) at all well. Much financial advice is geared at long-term questions like retirement saving, which is an unimaginable luxury for this 50%-plus. Few products a geared at saving for short-term goals – such as saving enough for a deposit to rent a new apartment – and certainly not with a combination of commitment devices to encourage the saving but enough access or control to make the money accessible in a real emergency. The book underlines how common is the experience of being on the edge financially, citing large-scale surveys to complement their detailed work. The latest US Census showed less than 4% of the population below the poverty line for the whole of 2008-2011, but 90 million (nearly one third) experiencing poverty for two months or more of the three years. In 2011 alone, 8.3% were below the line all year but about a quarter for two or more months. 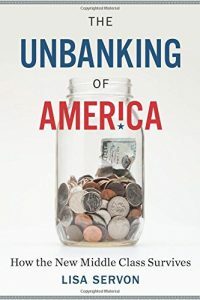 Both The Financial Diaries and The Unbanking of America are illuminating reads, above all, for paying attention to what people say, rather than just theorising about them. 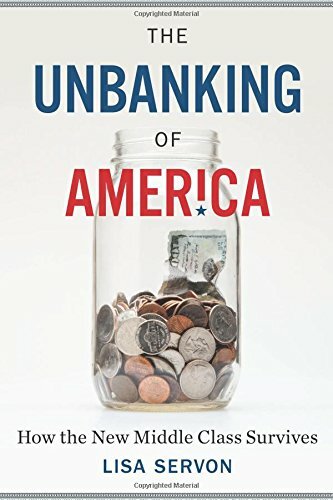 Even before reading the latest rash of stories about the absymal behaviour of the banks, one can only conclude that unbanking will be a good thing as long as entrepreneurs – and the regulators who make or break them – can deliver at long last on the ‘service’ part of financial services. This entry was posted in Main Page and tagged banks, poverty, review by Diane Coyle. Bookmark the permalink. In the late 1940’s my parents opened an account for me with our local Trustee Savings Bank. One consequence was that I finished my student days without debt. A forgotten world and a forgotten people. The book made me think that the old fashioned mutuals of my childhood – someone came round from the Royal Victoria or Pru to collect a penny or two a week – need to be revived. It was savings as much as insurance, eg for funerals. Also the informal Christmas Clubs at the local shops. YES, mutual savings and mutuals, in general, should be revived — but aren’t there regulations against them, making it for more difficult for any entrepreneur to try to revive them? “and few people will become entrepreneurs, micro or otherwise.” << This is also true about "owning the means of production", few want to be owners when the alternative is to sell the ownership for higher present consumption. Many are very happy to have the controlling power of owners, but Central & Eastern Europe privatization shows that normal folk, and poorer, far prefer more cash today.